An extremely important part of a home’s design is the attic ventilation. Proper ventilation can extend the life of your roofing materials, save you energy and help reduce moisture problems. 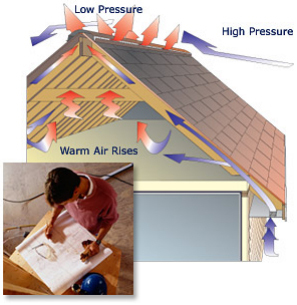 Typically the existing attic ventilation is inadequate in homes 15 – 20 years old. As a professional residential roofing contractor, we check your attic ventilation before we even get up on your roof. Peak or “Ridge” vent and open soffit vents work hand in hand. They allow air to flow from your open soffit, which is considered your intake, up through the attic space along the underneath side of the roof deck and out through the ridge vent, which is considered the exhaust vent. By doing this you accomplish two things. During the Summer months the air flow allows the roof deck to stay cool, helping to extend the life of your roof by reducing attic temperatures. In the Winter months cold air travels along the underneath side of the roof deck, knocking down the moist warm air that is filtering through your drywall and attic insulation. This airflow helps prevent the moisture from condensating and becoming trapped. Also, it keeps the roof deck cool which slows down the freeze and thaw cycles helping to prevent Ice Dams from occurring. There are several things DWM Roofing can do to ensure your attic is ventilating properly. If you already have open soffits and a continuous vent at your peaks, we first check to make sure that your attic insulation is not covering your soffits, blocking the airflow. Next we look at the size of the opening at the peak. If this opening is not 1 ½” to 2” wide we will make it larger before installing the new continuous ridge vent. If you don’t have existing open soffits or a continuous ridge vent DWM Roofing offers several different options we will discuss with you to achieve the required amount of air flow. ShingleVent II shingle over ridge vent is installed on all the peaks of you roof. It allows the air in your attic to vent through all the seasons. It is less than 1 inch in height. With a shingle-over ridge vent it allows us to install a pre-manufactured ridge shingle capping specifically for this application that are the same color shingles as your new roof. The exceptional airflow of ShingleVent II is due to an external baffle that creates low pressure over the vent openings to “pull” air from the attic. It also deflects wind and weather over the vent to help protect the attic from rain and snow infiltration. The internal weather filter provides a more complete barrier to help protect the attic from wind-driven rain, snow, dust and insects.